The phenomenal love team who drew 25M tweets last Saturday is featured in a sweet, funny, and catchy music video to complement their first commercial with McDonald’s. This is definitely one "kilig" moment you don't wanna miss! Watch out more of #AlDub here soon! 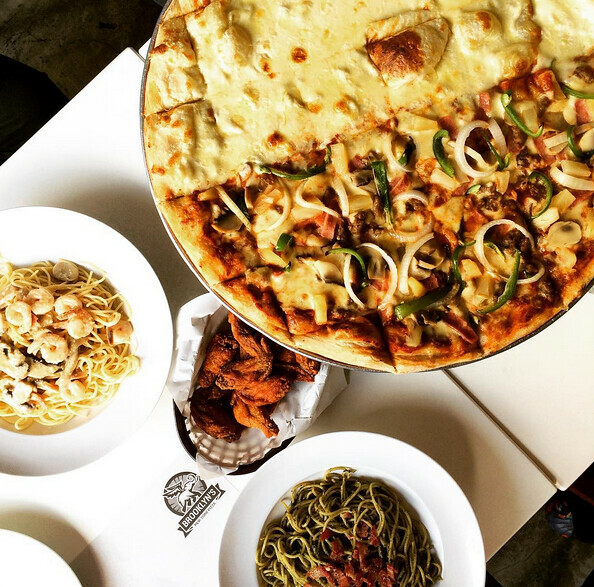 It's time to celebrate the Mid-Autumn Festival at Brooklyn's New York Pizza! 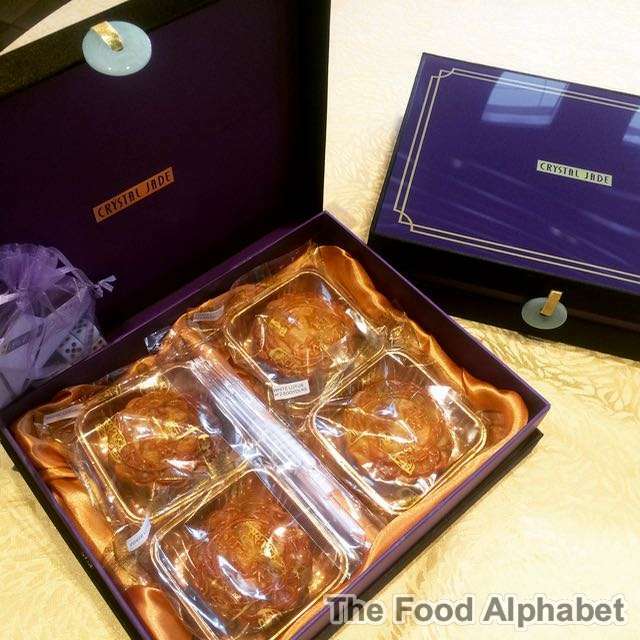 Invite you friends and family to enjoy the Chinese Mooncake season with a food feast and a dice game to test your fortune! Celebrate the Chinese Mid-Autumn Festival at Brooklyn's New York and with the Chinese Mooncake Festival Dice Game for only P600 per person, minimum of 12 pax, which lots of food and prizes to be won! The Mooncake Festival is a celebration we in our family have been doing for the longest time, and it's great that Brooklyn's New York Pizza is bringing to our Filipino community to have them see a part of our Chinoy culture. It's a date to remember! More reasons to love love love KFC! 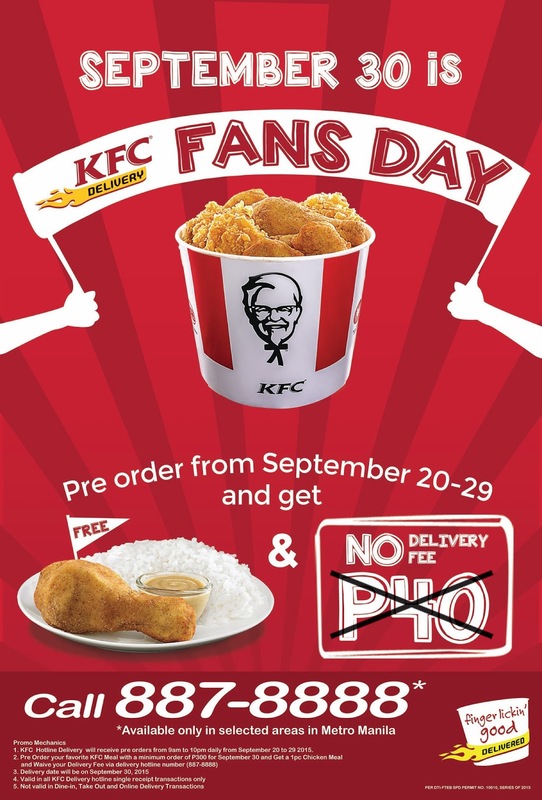 On September 30, KFC fans will be treated to a day of freebies and treats at KFC declares this day as KFC Delivery Fans Day! On September 30, customers who has reached the P300 purchase will have free delivery charge. Those who will order on the day online or thru delivery hotline will get a free 1.5L of Coke, while those who will pre-order between September 20 to 29 for a September 30 delivery via the hotline will get a 1-piece chicken meal FREE! 78th UAAP season heats up with Wingstop Sports Snack Bundles! As the go-to grub for sports events and celebrations, Wingstop’s flavorful chicken wings are a no-brainer companion for the upcoming 78th UAAP season. Famous for a wide selection of flavored wings, Wingstop injects excitement and soul into anything it becomes a part of. 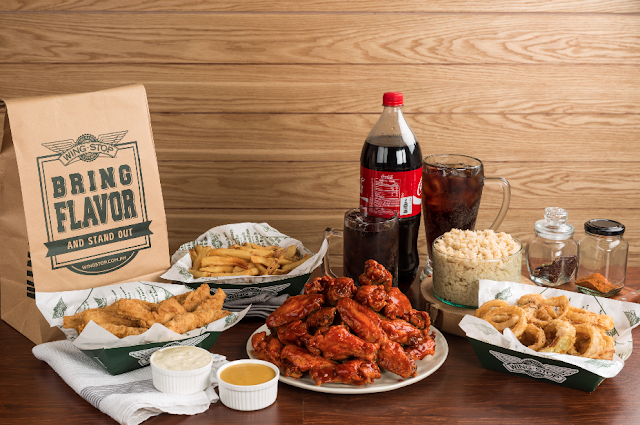 It just can’t help it, because Wingstop is all about hustling, keeping it real, and having a good time. And when it comes to sports, the call to flavor is the same: Let’s Get At It. Diamond Hotel Philippines joins in celebrating Mexico’s national day this September with LA COMIDA MEXICANA, a Mexican Food Festival. 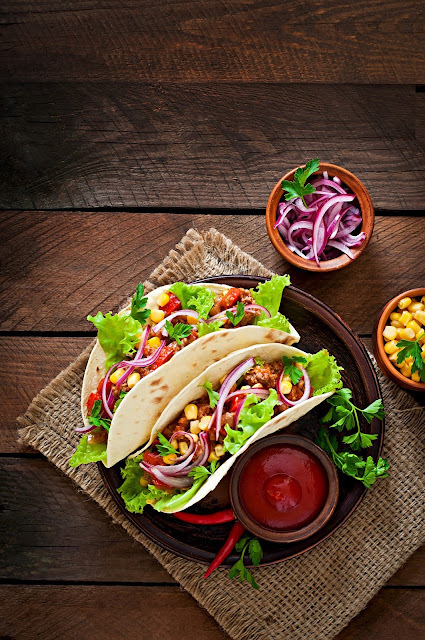 Feast your senses to the hotel’s dining destination Corniche, famed for its local and international food fiestas, will highlight the finest Mexican dishes as prepared by guest Mexican chef Daniela Romero for a very limited time from September 16 to 20, 2015 at their lunch and dinner buffets. What makes a great burger? What elements do one look for to determine the best on their radar? By spending an afternoon with Burger King, we’ll find out why their burgers are definitely #MARKSBETTER. On September 1, 2015, Burger King pays ode to the Whopper with their very own Grill and Chill Cookout. On this day, The Choice 2015 winner for Favorite Fast Food Burger by "THE KTG", reintroduces the Whopper by celebrating the importance of grill marks in searing and sealing the flavor of Burger King’s signature burger. By locking in that delicious, authentic beef flavor, they come to a characteristic that sets them apart from other burger chains. New Starbucks Cards to collect, new drinks to enjoy! Get them starting September 15th! I am particularly excited for the new Starbucks Company Card which will be available starting September 15th. This card has been offered to quite a number of countries worldwide and I'm glad they are finally having it here. 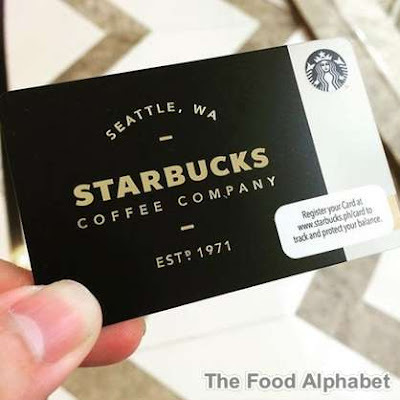 Exuding class and exceptional design, classic and bold, this Starbucks card is a must have. Available for an initial load of P300 only! Time flies fast indeed, and the Chinese Mid-Autumn Festival is once again upon us. Crystal Jade Dining IN joins in the celebration of an age-old tradition, and gives every diner the luxury and elegance with every masterful dish that you will surely enjoy. 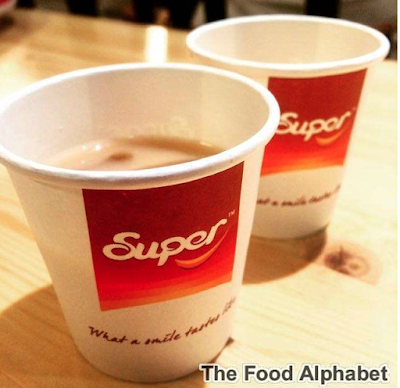 It has been a family tradition for us celebrating the Mid-Autumn Festival with a sumptuous meal, the ever exciting dice game and of course... Moon Cake. 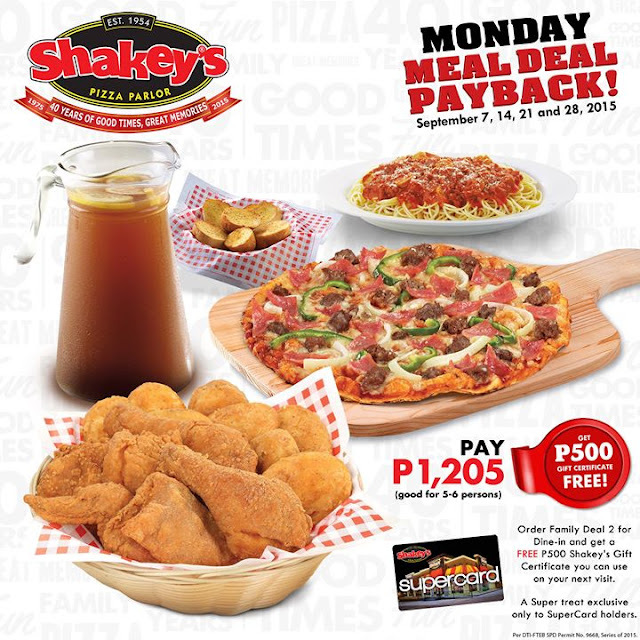 Monday blues are made better with Shakey’s Monday Meal Deal Payback! 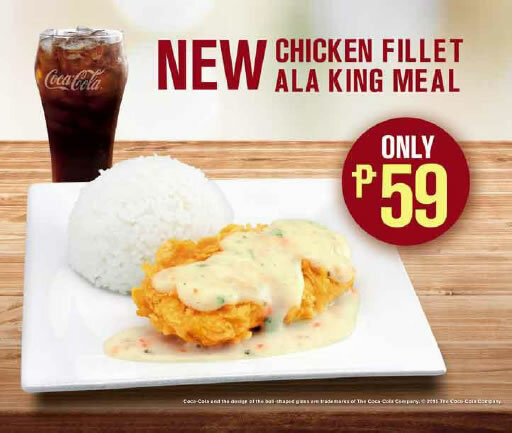 After much success to their 40% off on Chicken N' Mojos, comes another offer you can't resist! Get to enjoy a free P500 Shakey’s Gift Certificate for every purchase of Family Deal 2 worth P1,205, yup that's right for every Family Deal 2, so when you get 2 orders of Family Deal 2, you get P1,000 GC, and so on and so forth, you do the math. This offer is valid for ALL MONDAYS from September 7 to 28. For Dine-in and exclusive to all Shakey’s SuperCard holders. 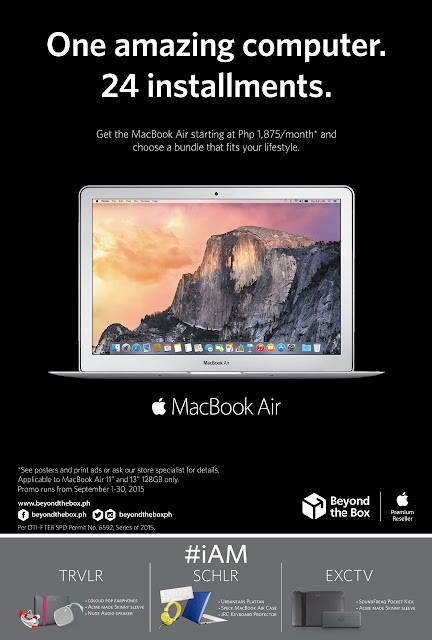 Now is the best time to get a MacBook Air at Beyond the Box! + Lifestyle Packages for your taking! It's the best time to get yourself a Macbook Air from Beyond the Box! Live your lifestyle to the fullest! Beyond the Box is giving you this once-in-a-lifetime opportunity to own your very own MacBook Air in easy Zero24 installments. Pair your MacBook Air with the lifestyle bundle of your choice and get a slew of awesome add-ons at no extra cost!